The journey of a group of Cornish women from tribulation to triumph has been highlighted by the announcement of a national award. Jane McFadzean, from the Wild Woman’s Hour project, who was crowned as Outstanding Digital Practitioner by the National Institute of Adult Continuing Education (NIACE), has dedicated this honour to the whole team. Set up by the Scary Little Girls theatre company and Radio St Austell Bay, to give isolated women a voice and help them develop new skills, Wild Woman’s Hour is a monthly radio programme made and presented by the women themselves. What the women all have in common is a need to overcome difficult circumstances. Some are survivors of domestic abuse, while others have had to cope with lone parenting, unemployment, living in isolated areas or simply feeling undervalued – often because of their age. A number of mothers with grown-up families felt they had little to contribute – but soon learned otherwise. Around 20 women answered an invitation sent out in December 2011 to take part in this unique venture. Radio St Austell Bay and Scary Little Girls, with help from other specialist technical advisers, journalists and performers, trained and mentored the team, who soon developed all the necessary skills to run the radio programme on their own. A variety of abilities and strengths which will be useful in daily and professional life have been gained. They include IT, written and verbal communication, journalism and research, sound editing and – crucially – confidence and self-esteem. The project has been made possible thanks to funding by FEAST (a Cornwall Arts Centre Trust programme funded by Arts Council England and Cornwall Council) and the ESF (European Social Fund) Community Grants Programme. Wild Woman’s Hour’s award was presented by TV astronomer Mark Thompson, from Stargazing Live and The One Show, at the BBC’s Salford studios. In true Hollywood style, the busy media stars were unable to attend personally but gave their acceptance speech via a video link. Although Jane McFadzean is keen to share the credit with the team, her own success is a shining example of what the project has achieved. Before joining, she had no experience in radio work or journalism but today she presents, makes journalist packages for broadcasting and expertly operates the mixing desk and other digital technology that lies behind radio shows. As well as the award itself, Jane received £300 in Amazon vouchers – which she has donated to the team to buy promotional T-shirts and hoodies. This is unlikely to be the last success story to come out of Wild Woman’s Hour. It has also achieved Best Practice status from the European Social Fund – the first ‘grassroots’, rather than governmental or international, project to receive this honour. It has also been invited to be a nominee in NIACE’s upcoming adult education awards. 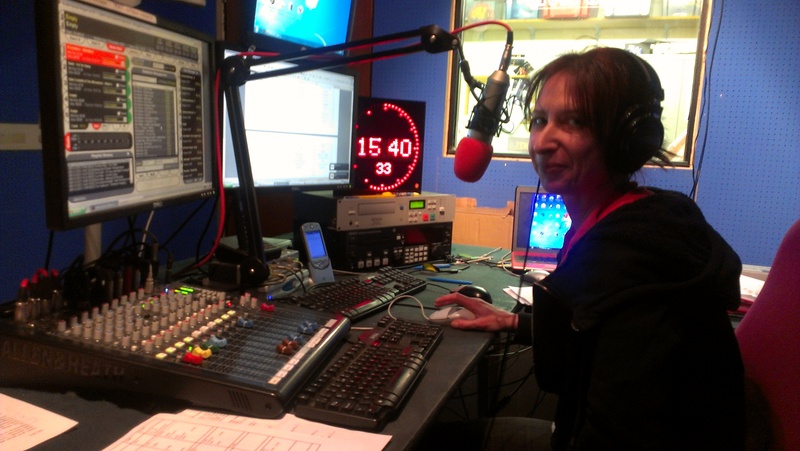 To listen to Wild Woman’s Hour’s lively mix of features and music, including a variety of women’s stories, both happy and sad, tune in to 105.6 FM, or listen online at www.rsab.org, from 3.00 pm to 4.00 pm on the first Wednesday of each month. And if you would like to join the team, call Sheila Vanloo, the Station Manager, on 07702 452265 or email info@rsab.org for details. Tags: radio project, Radio St Austell Bay, Scary Little Girls, Wild Woman's Hour. Bookmark the permalink.